I wish I could personally relate to the fact that most polish brand come up with a new collection for every season. Where I live, we only have 2 -- rainy and sunny. But as a polish lover, who am I to argue with new collections, right? Keep 'em coming! 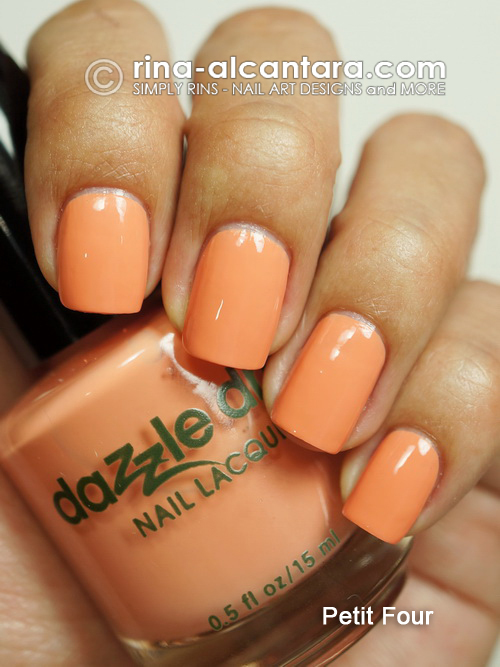 One of my favorite polish brand -- Dazzle Dry have launched its Spring collection for 2013 and they called it Afternoon Tea. Interesting, isn't it? Well, the colors did not really tickle my fancy. I'm a vampy girl. But regardless, they are dainty and delicious! The collection consists of 4 colors and I have 3 of those to share here. I'll be updating this post as soon as I get hold of the 4th. The first one is Dazzle Dry Petit Four. It is a creme polish that has a basic peach color. Formula is slightly thick and application is streaky. I had to apply 3 thin layers to get an even coat. If you are patient enough and love dainty hues, this will be worth it. I can also recommend this to ladies who are into nudes and would like to try something different without going stepping out of their comfort zone. Next is Dazzle Dry Spearmint Tea. I see it as a cyan, creme polish. At first glance, it could deceive you as Casablanca but they are totally different. The latter leans towards green. Spearmint Tea has more blue in it. In the photo is 2 coats. Excellent consistency but application can be tricky. It is a lovely shade that could make you stare on your nails like crazy. Finally, but certainly not the least is Dazzle Dry Forget Me Not. It is creme and dries like maya blue. Great formula and application was very manageable. The first time I saw Forget Me Not, it immediately reminded me of Dazzle Dry Aztec Blue. And just as I expected, they actually share the same shade! The difference lies with the formula. Aztec Blue is sheerer and has shimmer. To compare the 2 shades, I polished my ring fingernail with 3 thin coats of Aztec Blue. Its beauty lies with its shimmer. But this does not diminishes my admiration for Forget Me Not. Any favorite among these 3 dainty colors? I'm with you on the peaches. I don't think it suits me, too. Perhaps because of my skin tone. I love these kinds of colors. I think Spearmint Tea is my favorite. Great swatches. Did you buy this locally Rins? I love the peach shade! I have the same blue in another brand but might break out and get it anyway in dazzle dry. I have Casablanca but that Sparemint tea looks like a must to have! I love these!! Such bright and fun colors!! I'm so ready for it to be warm again, lol. I wish we had rainy and sunny.